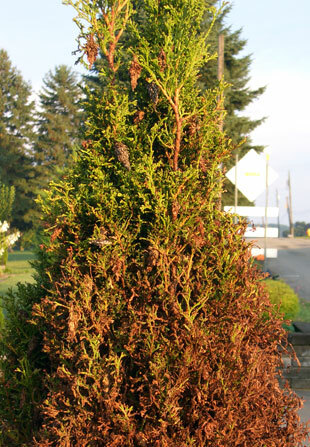 Ever see an arborvitae or Leyland Cypress tree that looks like this? Those brown things hanging from the branches are not pine cones. 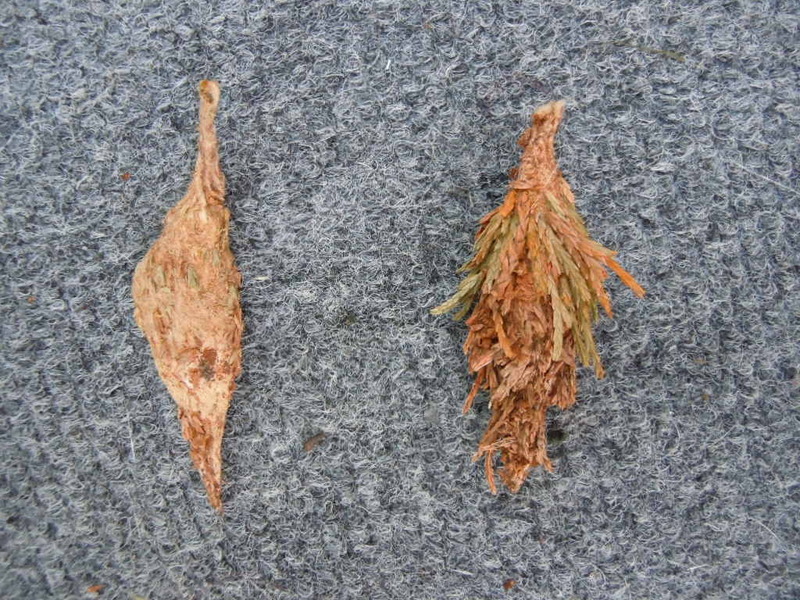 They are bagworm cases. 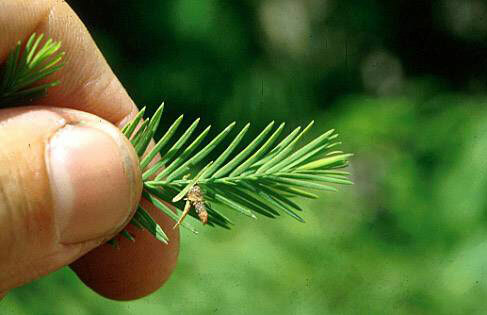 I had thousands of them on a tree in my yard (it's either an arborvitae or a Leyland Cypress, I'm not sure). These pests, if not dealt with, will infest and defoliate an entire tree. They seem to have an affinity for arborvitae / Leyland Cypress trees because I have only seen them on my tree and another arborvitae / Leyland Cypress in my neighborhood. In this photo, the case on the left has had the plant material removed. You must remove every single case from a tree in order to save it - do not leave even one, because each case can contain hundreds of eggs, which will hatch and recreate the problem. Simply spraying with insecticide does not work because it does not penetrate the protective case. 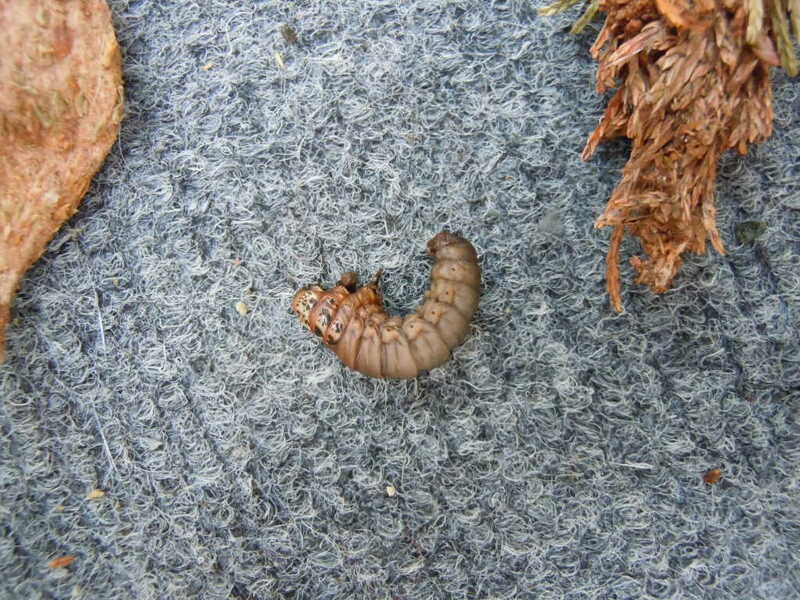 Smaller, younger bagworms make smaller cases, and these must be removed as well. If not removed, the young bagworms will continue to feed on the tree and enlarge their cases. Do not throw the cases on the ground or in the woods, because the eggs will hatch and the larvae will crawl up and infest the nearest tree. Crushing the cases is not good either, because while that will kill the adult females, it wll release the eggs in her belly. Throw the cases in a garbage bag, seal it well and take it to the dump immediately. I put the cases I'd picked off of my tree in a garbage bag and put the bag in a garbage can, and a few days later I discovered that some of the bagworms had eaten through the bag and crawled out of the garbage can, dragging their cases with them. Check your tree every day after picking off the cases, because odds are that you missed a few, particularly the smaller ones, which will continue to grow and become easier to spot.